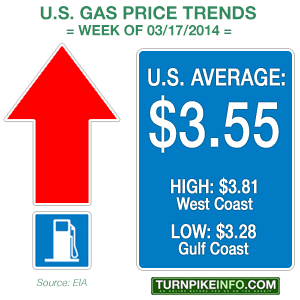 Gas prices have been on a steady upward climb for the past six weeks. The cost of a gallon of fuel was less that $3.30 per gallon at the start of February, but continued winter weather, geopolitical instability in North Africa and Ukraine, combined with rising global demand for crude oil, have all contributed to a continued spate of price increases. The upward trend also shows no sign of coming to an end. Although domestic crude oil prices finally slipped below $100 per barrel last week, they were pushing toward the century mark once more amid the escalation of tensions between the United States and Russia over Crimea, the apparent breakaway peninsula of Ukraine. The crisis in Ukraine has continued to weigh heavily on the price of commodities, particularly crude and natural gas. A significant portion of Europe’s natural gas supplies pass through Ukraine, and the country is also a major supplier of corn stocks which are converted to ethanol. Ethanol is later blended into U.S. gasoline products for retail sale. 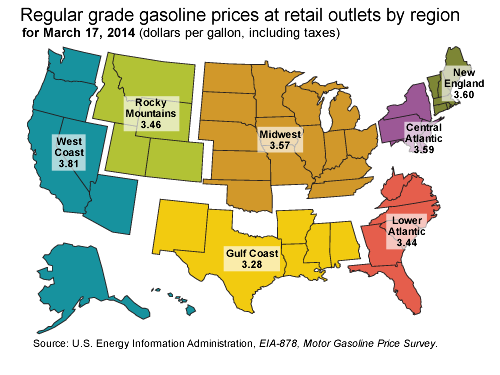 The other problem pushing prices higher is the seasonal adjustment toward summer gasoline supplies. Crude oil supplies had been declining during the past couple of survey weeks, according to the EIA. With the spring and summer driving seasons just around the corner, springtime fuel costs traditionally increase. This year’s price increases are coming on top of existing and atypical price hikes that have plagued drivers so far this year. Diesel fuel costs are no better, either. The average price of a gallon of diesel fuel is about two cents less this week than last, but the overall trend has been higher for most of 2014. The current U.S. average price for a gallon of diesel is back down to $4.00, from $4.02 last week, but that figure is about nine cents higher than the start of the year. For some regions, like the Central and Lower Atlantic regions, truckers are paying considerably more for fuel than even a few months ago, and the year over year numbers are downright dismal. Truck drivers in the Central Atlantic region are paying about 17¢ per gallon more for diesel than at this time last year, while the drivers in the Lower Atlantic states are paying about 10¢ per gallon more. At the national level, the price of diesel is about four cents per gallon less than at this time in 2013.